Details: The QlikView tutorial available on QlikTech pages is a self paced learning document which walks users through the features of QlikView. 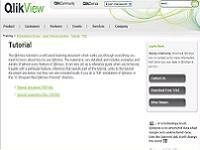 The material is very detailed and includes examples and details of almost every feature in QlikView. It can also act as a reference guide for finding solution to a specific problem or learn how to use a particular feature of QlikView. The Qlikview tutorial is a 225-pages PDF document with supporting files (a ZIP archive).